Steve Ross as Lieutenant Doug Roberts, center, surrounded by his crew. Photo courtesy of the Barnstable Comedy Club. Directed by Jeff Billard, the play addresses the noncombat struggles of war. Set on a U.S. Navy cargo ship in the Pacific the waning days of World War II. The play was written by Thomas Heggens and Joshua Logan, based on Heggens’ stories about his real-life experiences as a lieutenant on a Navy cargo ship, the USS Virgo, from 1944 to 1945. “Mister Roberts” won a Tony for best play in 1948. Steve Ross plays the title role of Lieutenant Doug Roberts, who runs the U.S.S. Reluctant efficiently and with a sense of respect and compassion for the men under his command. He is often in conflict with the arrogant and autocratic Captain Morton (Garry Mitchell), who uses Mister Roberts to further his own ambitions. Ross is perfect for the role of the ethical and fair-minded officer who, bored with the repetitive and tedious task of delivering supplies, yearns for a transfer to combat duty. Over and over, his requests are blocked by Captain Morton, gruffly played by Mitchell. Mitchell is also very well cast, his voice booming and commanding, his attitude condescending, yet revealing of his vulnerable nature. The two men display a very convincing animosity. Dan Powers is great fun as the less-than ethical Ensign Frank Pulver who is in charge of laundry and morale. He avoids work as much as possible, using his talents to devise various sophomoric pranks, many of which backfire, and to lure a female officer on ship for some cleverly created mock Scotch. His transformation is one of the highpoints of the show. Laura Shea, the only woman in the cast, is charming as Lieutenant Ann Girard, who knows how to stand up for herself. Keith Caldwell is Doc, the medical officer, who, jaded and tired of the war, is a loyal friend to Mister Roberts. Bob Bock plays Dowdy, who aids in the dispersal of chores aboard ship. 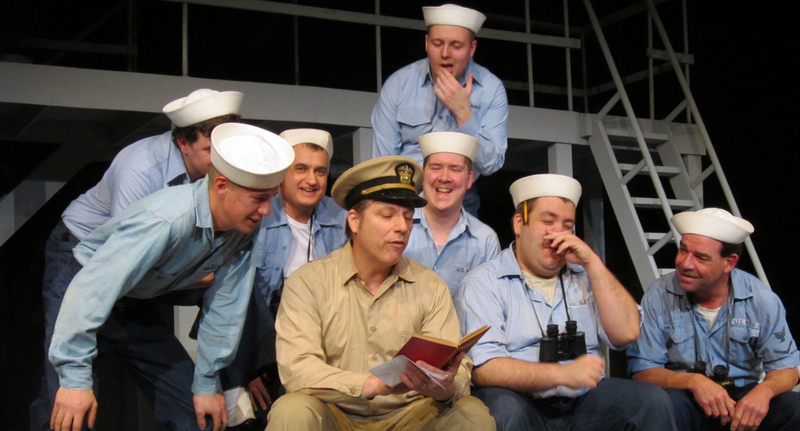 Most of the rest of the cast plays the motley crew of sailors, bored and overworked, amusing themselves by aiming their binoculars at the nurses’ shower in the onshore hospital, joking around, and just being guys. The play moves a little slowly in the first act, but the action picks up in the second, as the men are finally given a much deserved liberty, and the conflict between Captain Morton and Mister Rogers escalates. It is then that the men finally come together as a “crew, not just 167 separate guys.” All for one and one for all. It is a redeeming theme, in war and in peace, and in that world of noncombat duty in between the two. The show continues Friday and Saturday evenings at 8 PM and Sunday afternoons at 2:30 PM. There are talk-backs with the actors after the Saturday performances on March 24 and 31 and stories from real life World War II veterans after the Sunday, March 25 performance. The Barnstable Comedy Club is at 3137 Route 6A in Barnstable Village. Tickets are $18, $16 for students and seniors, and may be reserved by calling the box office at 508-362-6333.